Goodreads says, "Traveling abroad with her mother at the turn of the twentieth century to seek a titled husband, beautiful, vivacious Cora Cash, whose family mansion in Newport dwarfs the Vanderbilts’, suddenly finds herself Duchess of Wareham, married to Ivo, the most eligible bachelor in England. Nothing is quite as it seems, however: Ivo is withdrawn and secretive, and the English social scene is full of traps and betrayals. Money, Cora soon learns, cannot buy everything, as she must decide what is truly worth the price in her life and her marriage." Cora Cash is one of the richest girls in America and her mother is extremely determined to find her a good match. It's the beginning of the twentieth century, so where better to go than abroad to find a husband with a title? While over in England, Cora accidentally falls off her horse on the Duke of Wareham's land and of course, the Duke, Ivo, finds her. Cora thinks it's love at first sight and believe it or not, they are married not too much later. All should be perfect for Cora, especially now that she is the Duchess of Wareham, but things aren't as they seem. Ivo is elusive and she can't quite figure out his mood swings. Often times, Cora is walking on eggshells around him and to make matters worse, his mother doesn't approve of Cora. But nobody can deny how great it is to have some American money to restore the aging estate. Cora, who was the center of the social life back home, doesn't quite understand English customs and their ways and has a hard time finding her place in England. She finds herself committing many social faux-pas and blunders. On top of it, she hasn't found too many friends...at least ones that she can trust easily. 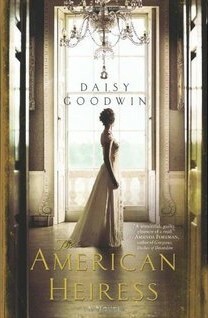 Daisy Goodwin's The American Heiress is filled with all of the ingredients that make an outstanding historical read: there's drama, romance, a beautiful turn of the twentieth century setting, betrayal, and a grandiose way of life that has long been forgotten. Cora is the the kind of protagonist that I love to hate. She's SUPER rich, beautiful, used to getting what she wants, and smart. At first I didn't like her, but I enjoyed her much more when she went to England as she was definitely a fish out of water. I enjoyed watching her squirm a bit, but as The American Heiress went on, I truly felt for her, because she was just simply trying to be happy despite many obstacles in her life. It just goes to show you that it doesn't matter how much money you have....money doesn't buy you happiness. It took me awhile to warm up to Ivo. I really didn't trust him and readers don't really get to know him too well for the first half of The American Heiress. He's mysterious and secretive, but as the story continued, it was pretty easy to figure out what was going on. Let's just say, Ivo is no Mr. Darcy. The varying points of view in The American Heiress made me nervous as I have struggled with that before in historical fiction, but Goodwin did a wonderful job making it all flow swimmingly. There are sections of The American Heiress that are narrated by Cora's maid, Bertha. These sections are also very entertaining as she is able to comment on the events in The American Heiress from a very different point of view. Who doesn't love the Gilded Age? I adore this time period and Goodwin really brings it to life. The extravagance is incredible...the clothing, the dinners, the servants...all very captivating. I mean they used live hummingbirds to entertain guests at one party and they discuss the fact that cigarettes rolled in hundred dollar bills were favors at another party. Seriously, there are no words....So, needless to say, if you are a fan of Upstairs, Downstairs or Downton Abbey, you'll enjoy The American Heiress. If you are looking for a captivating historical read that is well written and researched, check out The American Heiress. It sure doesn't lack in drama, witty dialogue, dark secrets, and an incredible setting; I highly recommend it for fans of historical fiction. I imagine that the backstory for Lady Grantham is very similar to Cora Cash and if Julian Fellowes makes the prequel series like he plans to about when Lord Grantham first met and married Cora Levinson then this book might become even more popular than it is now. That's what I was thinking, Christina! There's definitely a connection between Cora and Lady Grantham. I hope Julian Fellowes makes the sequel! I would definitely watch it. I hope you get to read The American Heiress soon. I think you'd like it! Thanks for visiting, Christina! Thanks, Svea! I hope you enjoy it as well. Thanks for dropping by! I'm really getting more into historical fiction lately, this sounds really interesting! I understand about having difficulties with varying narratives especially in historical fiction like his but I think it adds so much to the story. Definitely need to check this one out, thanks for the recommendation! Andrea- in this case the different narratives definitely added to the story...you are right!! I hope you enjoy the book as much as me! Thanks for stopping by! I am so glad to hear you enjoyed this book! I'm not always a fan of historical fiction, but if it's Downton Abbey-ish, then I'm in, haha. American Heiress, though, sounds like an entertaining and delightful story on its own and I look forward to reading it! I have been wanting to read this for a while. It sounds wonderful.